Toronto, ON – The Ontario Hockey League today announced that 2016 NHL Draft prospect Mikhail Sergachev of the Windsor Spitfires is the 2015-16 recipient of the Max Kaminsky Trophy awarded annually to the OHL’s Most Outstanding Defenceman of the Year. Sergachev finished third in scoring among defencemen with 57 points in 67 games including 17 goals which led all blueliners in 2015-16. Born June 25, 1998, the 17-year-old is the youngest rookie recipient of the award in OHL history and just the second rookie to win the award following Bryan Berard of the Detroit Junior Red Wings in 1994-95. Sergachev is just six days from being the youngest OHL defenceman to ever earn the distinction, doing so at a slightly older age than Craig Hartsburg who won the Max Kaminsky Trophy as a 17-year-old sophomore with the Sault Ste. Marie Greyhounds in 1976-77. A native of Nizhnekamsk, Russia, Sergachev was chosen by the Spitfires sixth overall in the 2015 CHL Import Draft. The 2016 NHL Draft prospect is listed eighth among North American skaters by NHL Central Scouting in their final draft rankings, and recently represented his country at the 2016 IIHF World Under-18 Championship in North Dakota. 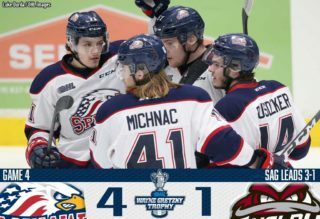 Sergachev finished the 2015-16 campaign offensively with 15 multi-point games including two four-point performances November 13 with a goal and three assists as part of a 7-4 win over the Mississauga Steelheads, and January 21 in a 5-3 victory over the Flint Firebirds. 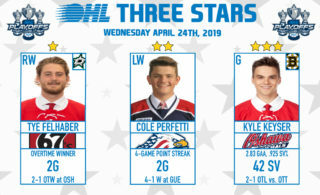 One of two defencemen named to the OHL’s First All-Rookie Team, Sergachev also received Defenceman of the Month honours for March, and was recognized in the OHL’s Western Conference Coaches Poll as having the Hardest Shot, and being the third Best Offensive Defenceman. Sergachev received 52 points in the voting process ahead of Toronto Maple Leafs prospect Travis Dermott of the Erie Otters who finished second with 48 voting points, and Carolina Hurricanes prospect Roland McKeown of the Kingston Frontenacs who finished in third place with 28 voting points. This marks the fourth time the Max Kaminsky Trophy has been won by a Spitfire following Darryl Shannon in 1988, and Ryan Ellis who won the award twice in 2009 and in 2011. Sergachev and Ellis are two of just six players to capture the award in their 18-year-old birth year along with Craig Hartsburg (Sault Ste. Marie 1977), John Slaney (Cornwall 1990), Bryan Berard (Detroit 1995), and Aaron Ekblad (Barrie 2014). 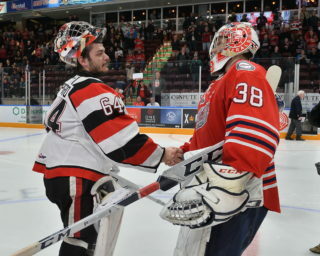 Other past winners since 1970 include Al MacInnis (Kitchener 1983), Chris Pronger (Peterborough 1993), Brian Campbell (Ottawa 1999), Marc Staal (Sudbury 2007), Drew Doughty (Guelph 2008), Dougie Hamilton (Niagara 2012), and Anthony DeAngelo (Sault Ste. Marie 2015). 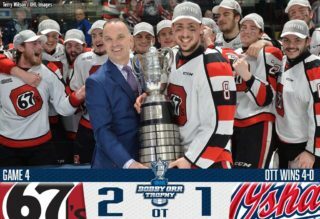 Sergachev will be formally presented with the Max Kaminsky Trophy at the OHL Awards Ceremony which takes place June 7 at the Hockey Hall of Fame in Toronto. He will also be the OHL’s nominee for CHL Defenceman of the Year to be announced on May 28 at the 2016 MasterCard Memorial Cup in Red Deer.